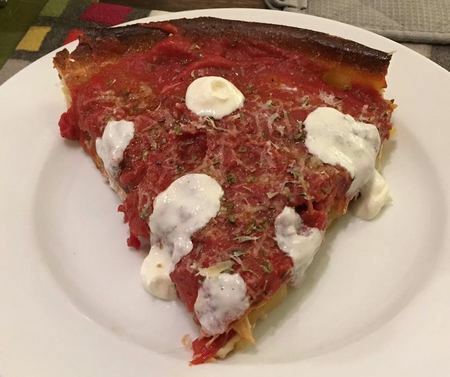 I made my first fully stuffed Chicago-style pizza. This was also the first time I made my own sausage (4 lbs worth!) 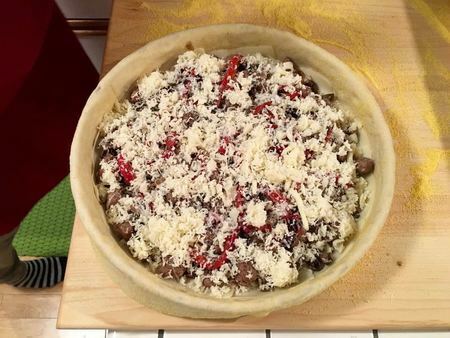 following the recipes in the Pizza Bible. 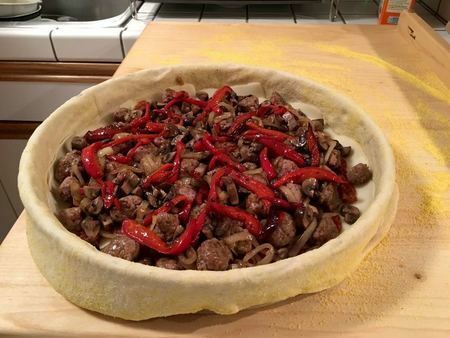 My guests REALLY liked the pie and the sausage! 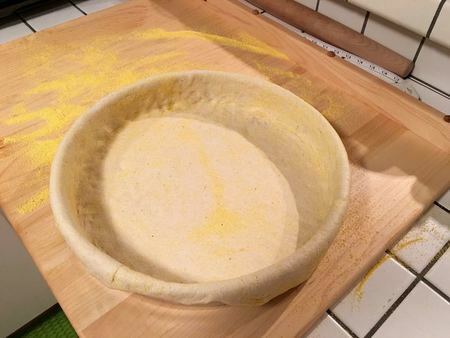 (2) Make the roping/knotting around the rim of the crust. Guests had arrived and I let this step slide. (3) FIND A BLACK STEEL DEEP DISH PAN!!!!! The bottom of my crust wasn’t crunchy (actually a bit soggy). I even precooked the sausage slightly to render some of the fat to avoid this and it still happened. 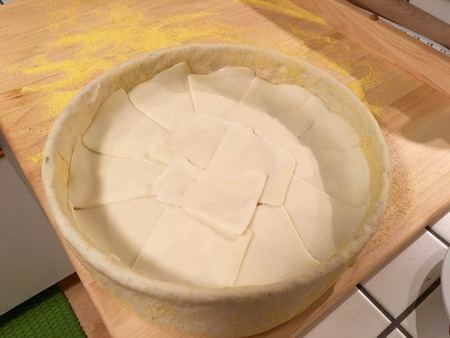 (4) More focus on the finishing aesthetics (placement and size of the ricotta cream). You're fast becoming a pizza expert in all styles! Sharing these pics, and the details of your trials is very helpful to others. 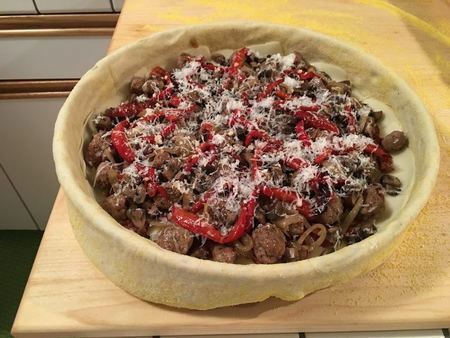 The pan makes a huge difference when it comes to Chicago, Sicilian and Detroit style. The black steel pans are harder to come by, but are great. If you can't get your hands on one, at least make sure that you get the heaviest gauge you can find. This helps with even cooking and will make a difference! I must agree, I think the pan material on this one probably makes or can make a huge difference. Let me know if/when you find a black, steel deep dish pan. 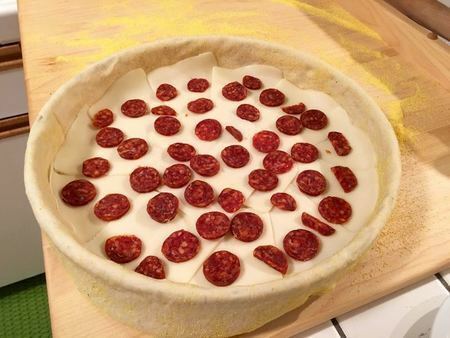 I am planning on making this pizza next and it looks challenging. 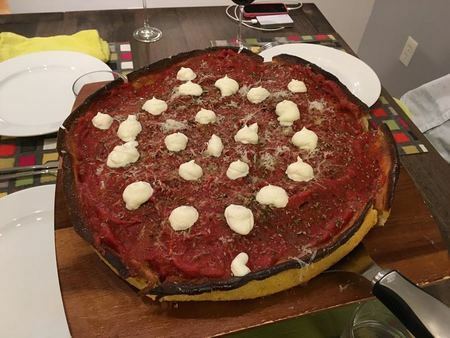 I have always wanted to make a stuffed pizza. Sbarro is the only place in my town to get a stuffed pizza, and its one of my favorite things at Sbarro. I was going to try and make the stuffed last week, but my delivery for a scale, a bunch of Maldon salt and diastatic malt got sent to the entirely wrong part of the country. 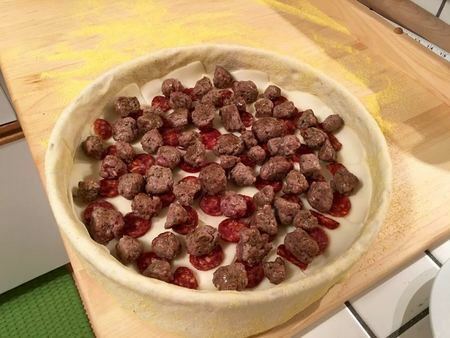 The recipe calls for meatballs, did you go with extra sausage instead of meatballs, ounce for ounce? I thought about doing that myself, but then I decided to go ahead and make the meatballs and freeze for later if necessary. The meatballs were the best that I have ever eaten. I invited my dad to eat with me knowing how much he likes meatballs and he could not even believe that I made it from scratch, he was astonished. I brought some to my boss for lunch the next day because he could not make it to dinner and he started talking to me about a raise! Go with the meatballs next time, they are amazing. I also attempted my first Sicilian dough for Focaccia. I kept thinking that I messed it up, but it turned out okay. I flubbed the oven temperature on the Focaccia, because it was still set for meatballs. It was for the better though, because I had to reheat most of the Focaccia later and it crispened and browned nicely. (1) I didn’t make the meatballs (too much for my first try). 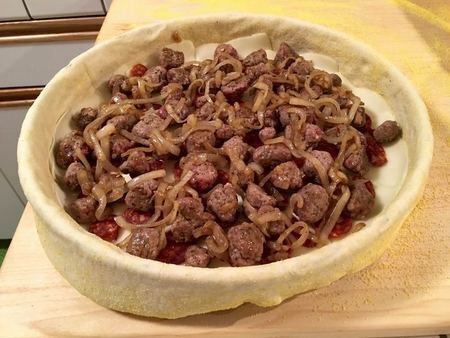 I put about 6 oz extra sausage. 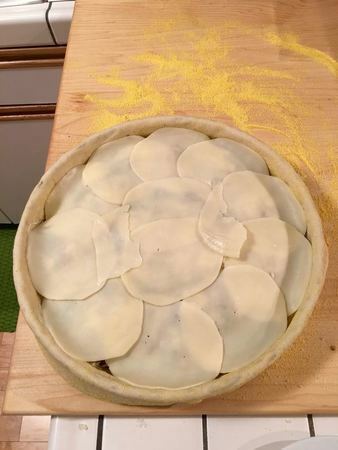 I was worried about too much making the crust soggy. Those meatballs and Focaccia look amazing! I will totally make the meatballs soon for a pizza!! (2) I found a source for the pans but I have to buy four pans for them to process the order. I think I’m going to order them and give one to my mom who’s getting into pizza now because of me. I will sell the other one or two. I might get two of them for a bigger pizza party. Here’s a source for the Allied Steel 13” black steel deep dish pans (model # SRPS13). I was worried that 22 gauge steel was too thin, but it’s the same gauge as the Sicilian black steel 12x18 pan I bought from FG Pizza. I believe this is the model to get. All the other Allied deep dish pans with a black buster coating are made from aluminum not steel. I just ordered four of them so I have 1-2 to sell. It was $112 with tax and shipping for all four pans. I’d be happy to ship one to you if you cover the cost of the pan and the shipping. I’m located in the Bay Area. Yeah, I think those are good pans. You gotta love the buy four get nothing free special, right! The FG Pizza Sicilian pan is definitely legit, if the material is similar, it should perform well. I was looking at the Lloyds pans with hole/perforations in the bottom to allow air circulation, but I do not know if they perform well. I am in the Charleston, West Virginia, 25311 area. Let me know what are some shipping options: time, price, etc, and the total cost. I could pay you through Venmo or whatever is the best option for you. Thanks for offering me this deal. Cool. I'll be in touch after the pans arrive.